"Some secrets are best left unsaid, and we all have secrets we'd rather other people not know about. 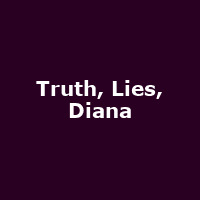 A playwright uncovers secrets about Diana and her death, that the establishment have tried to keep hidden. As he does, his own life starts to unravel and he becomes paranoid, suspecting the wife he is devoted to, of being unfaithful. Is Ray being manipulated by the 'men in grey' that Diana had always maintained existed, or does no-one in their right mind believe Diana was murdered? Ray finds similarities with Diana's inquest, to the cover up with the Hillsborough inquest. Then disturbingly links events surrounding Savile, Stephen Lawrence, the hacking trails, Edward Snowden and MI5 involvement in the MP child abuse scandal, into the same pattern. With meticulous forensic research, revelations from previously silent sources and access to Police witness statements and court transcripts, the nine handed play uses the actual words spoken by a cast of characters including the inquest judge and barristers, James Hewitt, Piers Morgan, Paul Burrell, Mohammed Al Fayed, senior Met officers, members of MI6, witnesses to Diana's crash, and the Royal Family. This unique 'factional' drama contains exclusive new information about the life and death of Diana. However, it is not a play about Diana as such, (she is not represented as a character, though Diana's own words are spoken), it is a play about betrayal and people who lie. "